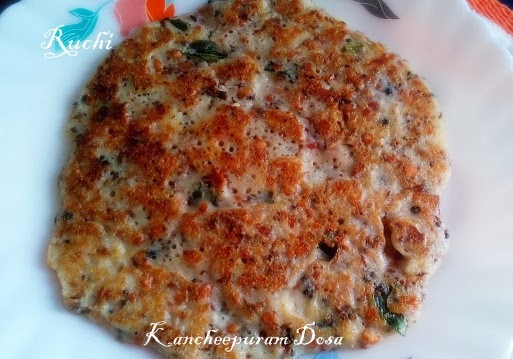 Kancheepuram Dosa is famous for its unique taste and flavor and small variation from the plain dosa. I adapted this recipe from Kitchen Tantra.But I made few change . In this recipe, the batter is prepared with Raw rice, idly rice, urad dal and Methi seed and tempered with spices. This recipe is a big hit in my family and it tastes excellent with tomato chutney and sambar. 1.Wash well and Soak rice and urad dal in water each separately. Soak fenugreek along with urad dal in sufficient water for around 4-5 hours. 2.Wet grind them each separately to coarse thick batter. Add curd and salt then, mix the batter together and leave it aside 8 hours or overnight. 3.Heat ghee/oil in a wok. Add mustard, pepper, cumin, ginger asafoetida, green chilies and curry leaves. Let them pop and splutter well. 4.Now add chana dal, urad dal coconut and roasted powder to this. Fry till they turn reddish brown. 5.Run this seasoning over the fermented batter. Mix them thoroughly. 6.Heat a pan over high flame and reduce to medium flame..
7.Take a ladle full of batter and spread it uniformly into a circle using the back of the ladle..
8.Add oil on the sides only after spreading the dosa.. Flip after slowly removing the edges of the dosa and cook for around half a minute..
Today I prepared special tomato coconut chutney. 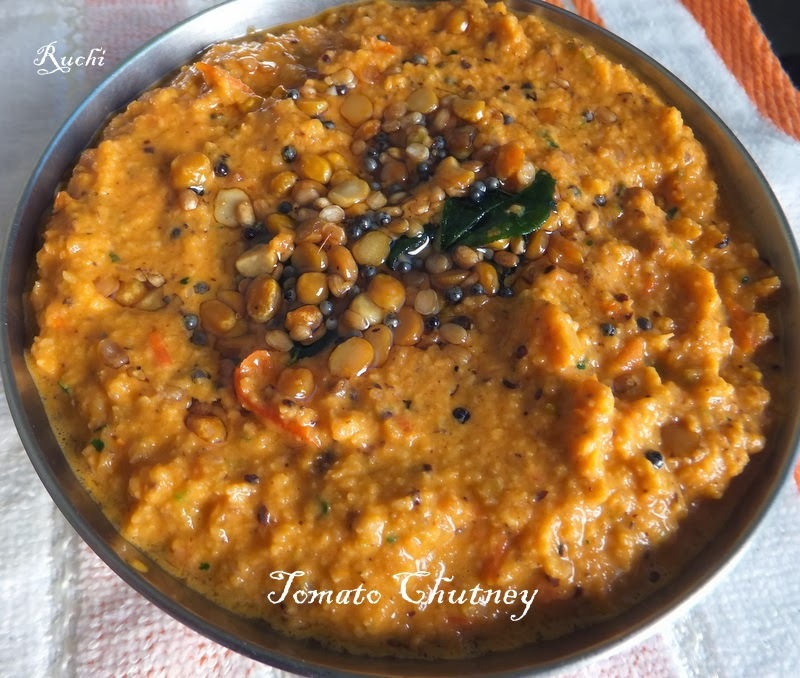 This version of tomato chutney is very simple and quick to make. This chutney is my Amma’s kaipakkuvam. I make this chutney often, in slightly large quantities, and it comes very handy during rushed mornings. It serves as a great side dish for idli dosai and even roti! Tastes best and It’s one of my favourite chutneys and is an amazing combo with rice and chuttaAppalam/Papad. 1. Heat the oil in a pan, add the chana dal, urad dal, greenchillies and curry leaves and sauté for a few seconds. 2. Add the tomato and sauté for 4 to 5 minutes .Then add the coconut and salt and sauté for another 2 to 3 minutes. 3. Allow it to cool completely. Grind it in a mixer to chutney consistency andTransfer it to a bowl. 4. Heat the oil and when it is hot, add the mustard seeds, Chana dal and urad dhal. 5. When the seeds start spluttering, add the curry leaves. Then transfer it to the chutney.& Stir well. delicious, lovely dosa. My fav. superb dosa and delicious too with a nice combo chutney Jaisree!! Both dosa and chutney makes me hungry..Cant resist akka..